I announce the second Hungarian-theme campaign: The Zrínyi Campaign! 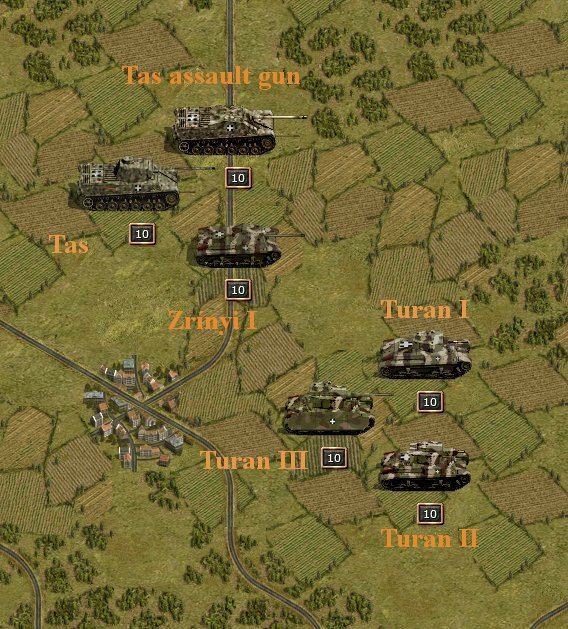 Part II 1944-1945 (v0.8 ) Attention: this part of the campaign is not yet finished! There are 4 scenarios to play and the campaign path will go forward only, if you make constant Decisive Victories. To start playing campaign part II, you have to load the last saved game from the campaign part I, after installing part II. It is a close relative to the Turan Campaign. After I finished making the Italian Campaign 2.0 I planned to take some rest because it took enormous time from me... Still I was interested in McGuba's Hungarian campaign - maybe because I'm also a Hungarian. But I don't wanted to spend much time/energy with the creation. So, I helped several ways McGuba and we made the first versions of the Hungarian equipment data together. Later I was gone inactive while he developed the campaign further. When I then later downloaded the 0.3 version I was happy with it - but It had also many parts which I disliked. So, I decided that I invest again much time and energy to create an alternative version of the Hungarian Campaign where many parts are the the same as in McGuba's version but it many parts it has big changes! The campaign tree will be also different at the later stages of the war. What I surely not want that the Zrínyi Campaign would be looked as the competitor of the Turan campaign and a decision should be made "which is better". I think everybody can benefit of it if there are more possibilities to play a campaign. What the major differences will be? I will explain it in the next post. Last edited by Uhu on Mon Jul 23, 2018 8:07 pm, edited 12 times in total. - Player's core army has the main role in the battles. Aux units are mostly minor. - Player get more rewarded for making DV's: more prestige, gift-units, different campaign path. - Overworked equipment file: base was deducter's modification plus after that 100+ entries has been changed! - Prestige reward and allocation set back to the original rules. - Some Hungarian units have different stats which can be quite big: like the Soft Attack rating of the Csaba and Toldi vehicles changed from 3 to 2. - The use of artillery towing units revised - I felt it unfair to reach time-based goals while the player have only snail-slow arty transport vehicles. Moreover that artillery is critical to make victories without high losses! Therefore all three major tow units (Hansa-Lloyd halftrack: 100, 105mm arty / 35M KV-40: 80mm AA, 149mm, 150mm arty / 32M Breda: 210mm arty) has the same stats including move=6. Expect that Hansa-Lloyd has halftrack movement type while the other two has recon-like wheeled movement type. - Some high-level units will be additionally available (Pz IVF2 at Don, Tas assault gun, 210mm arty, etc.). - General Hungarian color pattern for fighting vehicles in Hungarian duty. - Massi's tiles changed back to classic (original) tiles. - After the Alexeyevka scn (which has been also deeply changed) another 3 scenarios will happen in Russia. - After the successes (DV's) in Galicia and South Transylvania a different "what if" campaign path will open. Last edited by Uhu on Sat Jun 22, 2013 8:10 am, edited 1 time in total.
? Alföldi Tank Battle ? - Part of the scns are deeply (!) modified from McGuba's Turan Campaign: 1-10, 14, 16, 17, 21-23. - There are some "air-only" scenarios: 12, 13, 15. - 1-16 scenarios were many times playtested (and modified so many times as needed) so they are complete. Last edited by Uhu on Tue Sep 24, 2013 11:50 am, edited 4 times in total. I'd suggest a name change for scenario 20a: Unbidden Guest -> Uninvited Guest- From what I know that is the correct English term. Thanks for the advice - sure, google-translate is not always the best solution. Anyway some of the scenario names will probably change. KeldorKatarn wrote: I'd suggest a name change for scenario 20a: Unbidden Guest -> Uninvited Guest- From what I know that is the correct English term. The campaign is finished till the end of 1943. Hmm and I'm thinking about the make the Alföldi Tank Battle. It was one of the biggest tank battle after Kursk. And I'm planning also making the Konrad 3 with the combination of the siege of Budapest. It could happen that the campaign paths will have more lines than just two. I made several new icons for Hungarian armoured vehicles too - I will post them soon. If the player will succeed to defense the industry from the US bomber swarms he will have the sources - prestige - to buy some nice machines...like the Turán III (long barrel), Zrínyi I assault gun (long barrel), Tas assault gun, Tas panzer. Sounds very nice, and I'm interested on how you will integrate the air-only scenarios into the campaign, looks like quite a challenge to balance them? Speaking of the Hungarian airforce, will there be seperate units to represent the MÁVAG Héja (modified Re.2000), and perhaps even the 'what-if' fighter based on the cancelled He-112 license, the WM-23? ThvN wrote: Sounds very nice, and I'm interested on how you will integrate the air-only scenarios into the campaign, looks like quite a challenge to balance them? What do you mean? Maybe that they gain experience therefore faster? Not really: the xp system is modified - after 200 the growing is slowed down significantly. Otherway as the best fighter will be the Bf 109G (variant G-14 in Sept. 1944.) without xp you wouldn't have much chance. I'm already finished two air-only scenarios now I had one combined and there will be another air-only. I don't encountered any balance problems - for which I take a lot of attention. ThvN wrote: Speaking of the Hungarian airforce, will there be seperate units to represent the MÁVAG Héja (modified Re.2000), and perhaps even the 'what-if' fighter based on the cancelled He-112 license, the WM-23? I made earlier thoughts about that but I than cancelled to put it in the campaign. It was too far for me from the reality as it's production was not cancelled by outer powers (like bombings) but inner mechanical problems. But the already mentioned armour types will be there. Well, I was just curious if it was difficult to balance the air scenarios, especially how the victory conditions are tuned. Seeing as plane vs. plane combats can give widely varying results easily, it just seems very difficult to me to account for different core compositions, unless you use a lot of auxiliaries? But I have no doubt you can make it work, you sure put a lot of thought in it already! Oh, I understand now what you meant. Well that's a good question. For air-only scenarios there is a deployment limit which allows about 6-8 planes. So if the player plays on a., Rommel mode - he will not have anyway much credit to maintain a big air force but at these scenarios he can buy/upgrade. So he can adapt to the scenario goals (if needed) b., Other difficulty levels: there will be prestige enough to buy whatever he wants so... At least I hope so it will work in that way. I play always on Rommel and I think that is the level which gives the real challenge - playing scenarios several times until you get the DV with not so high losses. But of course I don't have nothing against it if other player play it on lower level. ThvN wrote: Well, I was just curious if it was difficult to balance the air scenarios, especially how the victory conditions are tuned. Seeing as plane vs. plane combats can give widely varying results easily, it just seems very difficult to me to account for different core compositions, unless you use a lot of auxiliaries? But I have no doubt you can make it work, you sure put a lot of thought in it already! Here are the new Hungarian steel beasts! They could have a little more shadowing - which I cannot make. If somebody would volunteer to make right shadows them please PM to me. Nice! But what is wrong with those shadows? They seem ok mostly....except maybe on some the gun causes no shadow. I'm recently played/tested the Hungarian offensive in South Transylvania in aug-sept. 1944. - That means from the "winner" path there are just 3 scenarios to be made (although that is much because they had to created from zero - hopefully Nikivdd will help me on this. ). - The "historical" path has to be made too: Torda defense has to fine tuned, the great tank battle on the Alföld in 1944 autumn has to be made and maybe McGuba's Budapest scenarios will be modified or redesigned to make the Siege of Budapest, Konrad 3, and maybe the Spring Awakening scenario. - Some other minor work is also in the pipeline: making a few more briefings, making the campaing path, unit info screens in the Library. I would say the progress is about at 70%. Szia Rockety! Thanks for the interest! Well, no update yet: in the last months I played the heavily modified GC's intensively. I plan to finish them first (I'm in the beginning of 1945) and only after turning back to the Zrínyi Campaign. Still I will surely finish this project. Question is if Nikivdd would some day make the needed scenarios - I would be happy if he would do that - but if not then I will make them - which costs surely more time. Uhu wrote: Szia Rockety! Thanks for the interest! 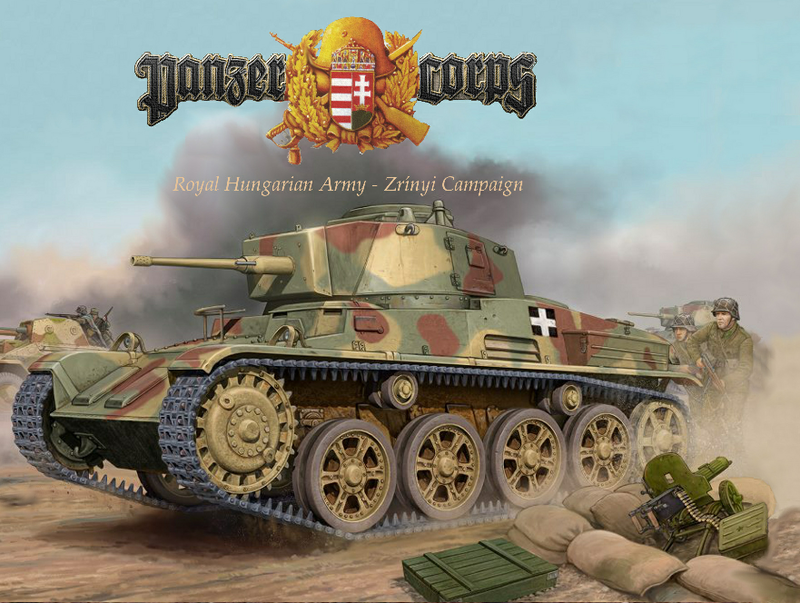 I am also interested in this campaign.Once - around 2006-2007-2008 i've made a hungarian campaign in Panzer General 2, but remained unfinished.I've done 20 scenarios, still lack around 3. Would be great to try these Zrinyi and Turán campaigns.I will write u a private message if is possible. So, any additional news on this mod? While Turan Campaign followed a much closer historical path, i see your mod will take some liberties and give us a "winning" path ,as you say it, for the RHA, that is some great news!